According to the Hungarian News Agency/Greenfo, "The new system will include 1000-1100 bicycles and 70-80 docking stations. It will cover the most densely build-up central part of the city of about 7 square kilometers. The cost of the system is HUF 1.32 billion (EUR 5 million). The system will be installed and managed by Parking Ltd. - a public company in charge of inforcing [sic] of the city's parking policy." BuBi's beta testing is reported to begin in June 2011 and will be funded in part with European Union funds. I had heard of a Spanish effort, either at the regional or national level, to promote bike-sharing that occurred in November 2007. It was a conference solely about bike-sharing. I would have loved to have been there to learn about Spain's advancement of bike-sharing. The country is at or near the top of the list for the sheer number of services it offers, so there's a lot of knowledge individuals there can share. A new conference was held on September 10 in Biel/Bienne, Switzerland called Koordination Bikesharing Schweiz/Coordination Bikesharing Suisse (Swiss Bike-sharing Coordination). According to their website, the organization's purpose is for "The coordination of bike sharing [to] provide an exchange platform around this new bike phenomenon". Switzerland has 30 bike-sharing services using three systems (nextbike, velopass, and Bieler System) in the central and western part of the country (see p.3 of their newsletter). For more information, check them out. It's great they're being proactive like this. Others countries, including mine(! ), should take note. p.s. - Here's their agenda and newsletter. With the launch of Capital Bikeshare today, it’s a day for those of us who worked so hard for so long to celebrate. So much blood, sweat, and tears were put into getting where we are today. Well, there wasn’t any blood, but the sweat and tears will more than make up for this. So many great people worked on putting together Capital Bikeshare and I’m happy MetroBike was able to make this happen for Arlington County and to work with so many great partners, including the District of Columbia Department of Transportation, graphic designers, sponsors, the public, and so many more. It’s also a day for Washingtonians to celebrate. Now a great new way to get around is available. It will help clean our air, lessen traffic congestion, and get folks fit. It’s so wonderful to see a dream come true. 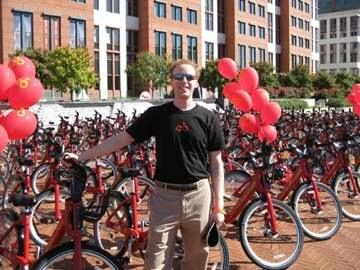 I first learned about bike-sharing in 1995 as a student at the University of Virginia. I was working the graveyard shift as a computer consultant at a computer lab, surfing the Web to pass time until my shift ended at 11pm. It was there that I saw a webpage with two photos of Copenhagen’s Bycyklen, or “City Bikes”, on the screen. The website was very bare -- white background, a couple of paragraphs in English, and those two photos. That was all it took. I found myself studying abroad in Copenhagen the following semester learning more about their 2nd generation coin-operated system. 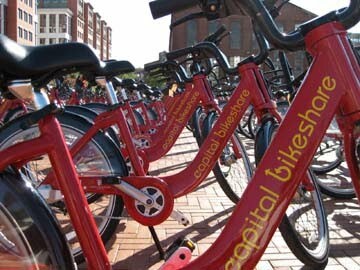 It was the first large deployment of bike-sharing anywhere in the world. Amsterdam had dabbled in bike-sharing twenty years earlier with a 1st generation service where bikes were simply left on the street for the public’s use. During my research I kept thinking to myself, “this idea is a win-win -- great for the environment, public health, and in getting folks on bikes. Why hadn’t bike-sharing taken off elsewhere around the world?” When I returned to the U.S., I advocated for bike-sharing, mainly through academic research for my Masters degree, writing some of the very first published articles on the topic. Eventually, just writing about bike-sharing was no longer enough for me. I needed to get my feet wet and begin being more proactive about it. 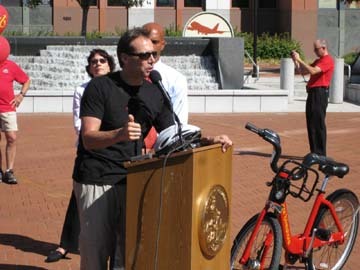 “Be the change you wish to see,” was what Gandhi said, which I took to heart in 2004 when I founded MetroBike, LLC for the purpose of bringing bike-sharing to the U.S. Cycling in the U.S. is only about 1% of all trips in car-dominated America, but why not think big, right? I started The Bike-sharing Blog and The Bike-sharing World Map to continue to educate a wider auidence about the topic and began picking up clients from around the world who heard about bike-sharing and wanted to make it happen in their part of the world. When I started the Blog in May 2007, just before Velib’ launched in Paris, there were about 17 bike-sharing services worldwide. Now in 2010 there are about 200. 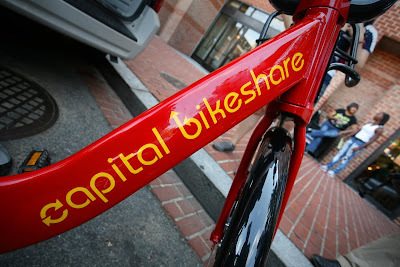 Make that 201 today with Capital Bikeshare! While I’d like to say that The Bike-sharing Blog helped add those 183 new services, I think Paris may have played a slightly larger role with their mega service of over 20,000 bikes. Thank you Paris. They say it takes a village to raise a child. The same could be said about starting a bike-sharing service. So many people positively shaped this weird idea of renting bikes for a short period of time to take this idea from Amsterdam to Copenhagen and now to Washington, D.C. and Arlington, VA. I guess dreams do come true. 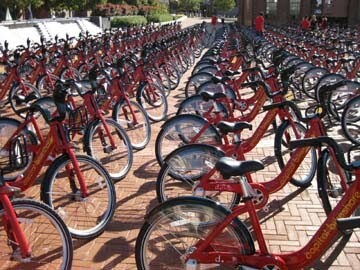 You may have noticed that coverage of the launch of Capital Bikeshare has been a bit heavy on The Bike-sharing Blog. My company, MetroBike, LLC, is involved with this new service which will be the largest as well as only year-round and regional program in the U.S., so I've been sharing all the exciting lead up to the launch. I also plan to share data from this service with Bike-sharing Blog readers as it's available. With the launch of Capital Bikeshare just a few days away, the details are now set and you're invited! Speakers will include D.C. Mayor Adrian Fenty, Arlington County Board Chair Jay Fisette, and likely some yet-to-be-confirmed Federal representatives as well. Did someone say Obama? We didn't invite him as he probably has other things to do (like run the country), but with The White House only about 2 miles away, I think we could add the President to the agenda if he were to show. After the event, we'll be getting into groups of 5 - 7 Capital Bikeshare members and riding to selected stations to begin populating them with bikes and get back to the office. I hope to see you there!